One of the hardest questions that mathematics teachers have to answer is “Why?” Schoolroom sums are crucial in learning the awesome power of mathematics, but they are often a world away from how the knowledge is applied and where it came from. 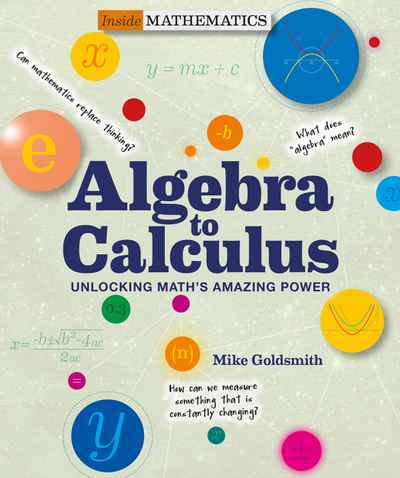 Inside Mathematics: Algebra to Calculus is there to fill that gap. To some the term algebra is a baffling torment that has no meaning; to others it is perhaps the most powerful tool in mathematics. The word algebra comes from the Arabic language because this unifying force of math arose in Baghdad 1,200 years ago. It takes the numbers out of calculations and and in so doing allows us to investigate mathematical ideas like never before. Thanks to a lazy morning spent in bed by René Descartes, algebra can turn lines, surfaces, and shapes of all kinds into equations. Isaac Newton used it quantify natural processes using an infinite number of tiny values to find the answers. He was very proud of “The Calculus” and it became the focus of the biggest dispute in scientific history. Inside Mathematics: Algebra to Calculus introduces the amazing people who figured out how equations work and how they can be used to investigate nature. Written to engage, entertain and enthuse young people, it show readers how ideas of long-dead geniuses ended up in their homework assignment: Algebra unlocks the laws of physics, such as Galileo’s Law of Fall, which was the first hint at how gravity works—and how all motion can be measured and predicted. Calculus goes even further, by opening up math to the fluctuations of nature, from the actions of sound and heat to the motions of asteroids—and even warps in the fabric of space and time.